LEARNING CURVE: "Teachers across the length and breadth of Jamaica are playing significant roles in community development as mentors and in a variety of community activities," remarked PM Portia Simpson-Miller, speaking at last Sunday's awards ceremony at Jamaica House, where 40 long-serving teachers were honoured with the Prime Minister's Medal of Appreciation for Service to Education. The PM seized the opportunity to implore the nation's teachers to step up their efforts in the protection of our children. "I've taken notice of the recent violent attacks (against children). These acts of terror have left us shaken," she told the gathering. "As we go forward, teachers will have an eager role to play in helping to educate parents and guardians, sensitizing them to the security needs of their children, not only at home, but also within and outside of the classroom." 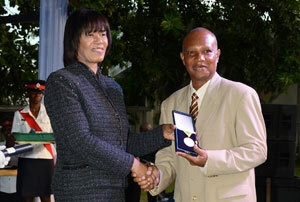 The teachers who were honoured, including Albion Mountain Primary's Leroy Marshall (above), have served a minimum of 15 years in Jamaica's education sector. STEPPING UP: Information minister Sandrea Falconer greets Olivia 'Babsy' Grange, Opposition spokesperson on gender affairs, and Lorna Golding, wife of ex-PM Bruce Golding, ahead of the start of the Mona School of Business Management's inaugural lecture, held recently on the Mona campus. 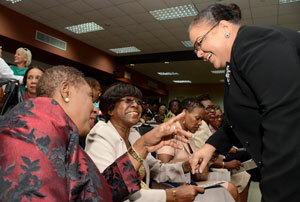 In a message from the Prime Minister, read by Falconer, Simpson-Miller urged the country's women to embrace their roles as leaders. "We must use that leadership role to contribute to the development, not only of self, but the wider community, and our nation as a whole," she said. "The fact that women continue to make a positive impact in every aspect of society, the transformational potential of women leaders at all levels -- self, community and country -- is yet to be fully realised."